Rent vs Own. 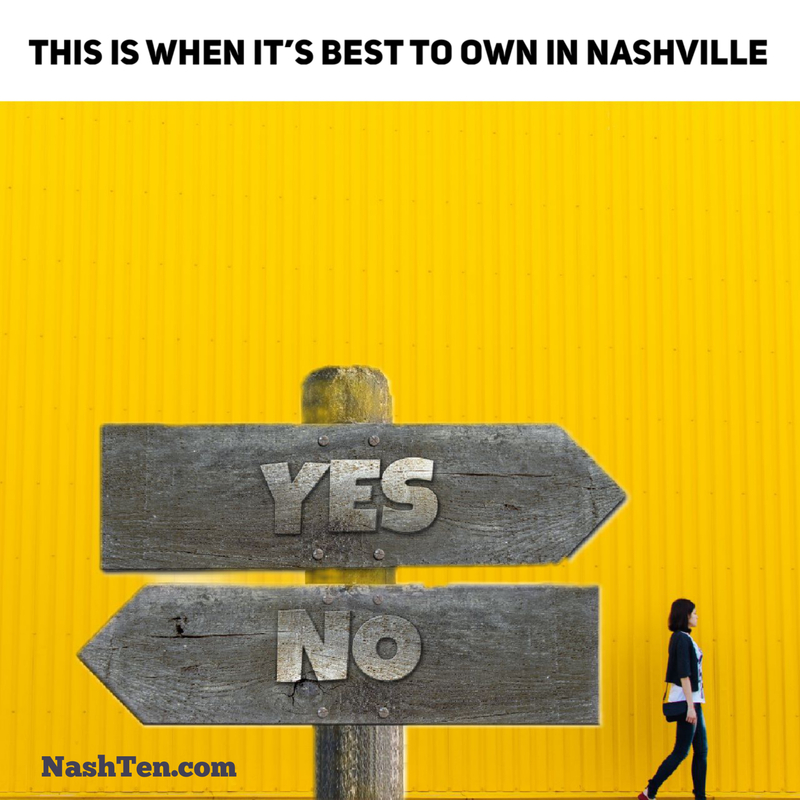 This is a question many people consider when they first move to Nashville. And when you look for answers, it’s confusing. That’s because many studies just look at the immediate impact. They only consider the average monthly cost to rent vs the average mortgage payment. That would be OK if you were planning to live there short term. However, if you want to stay in Nashville for more than two years, then you should have a long-term view of the true cost and benefits of both choices. As far as rentals go, the price in Nashville is easy to determine thanks to Zumper, a leading, national apartment hunting site. The average three-bedroom unit in Nashville rents for about $1,668 per month with annual rent increases each year around 4%. Over the last three months, the median sale price for a three-bedroom home in Metro Nashville is $264,900. Using the Zillow payment calculator, that price with 5% down and a 4% interest rate would equal a $1,747 mortgage payment including estimated taxes, insurance, and PMI. That’s $79 more per month to own and that’s where most studies end. However, they didn’t take into account appreciation, equity, and maintenance. Over the last decade, Nashville prices have grown an average of 7% annually. That’s enough to double the value of your home in 10 years. In addition, a portion of your payment every month is applied to your loan balance which also boosts your equity. In this scenario, it equals another $66,636 in your pocket over the first ten years. Maintenance costs are harder to average because it depends on the home that you purchase. For example, a new (or recently renovated) home will typically have fewer costs in the first few years. The other item missing from these studies is the joy and satisfaction of owning your home. Only you can put a number on that. I hope this sheds some light on the subject for you. However, if you need help with your situation, message me: m.me/NashvilleRealEstateNow. We are here for you.